If you know me, you know I love a good pair of pants. Patterned, pleated, stretchy, I love them all. What most people consider to be an afterthought to their cute shirts I think of as the star of the show. I fantasize about pants, I Pinterest stalk pants, and I have way too many favorites to comfortably fit in my closet. 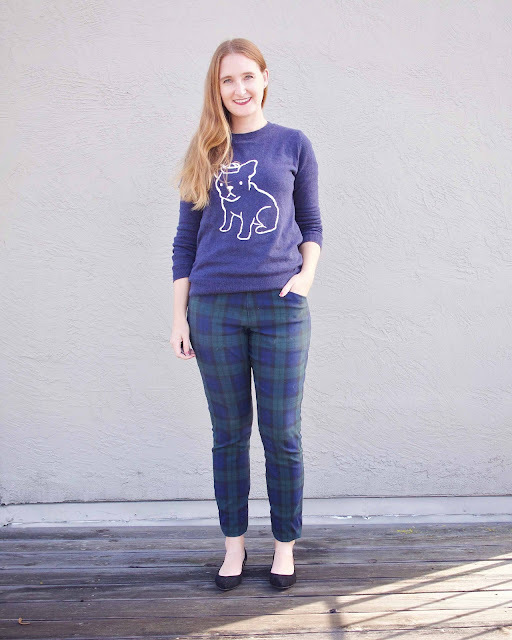 When I saw Lisa's tartan trousers on the Tessuti blog, I had instant pants envy. 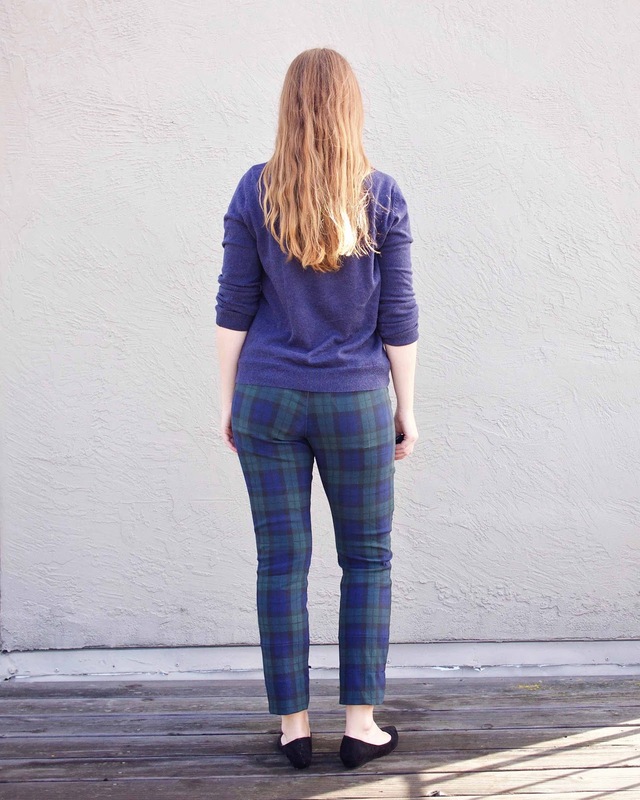 While plaid pants may remind you of Christina Aguilera in the early 2000s, Lisa's are subtle, sophisticated, and totally work-appropriate. I had to have them. I finally spotted the perfect fabric at Fabric Outlet SF at the perfect price to try out this look. And unlike Lisa's, this fabric is very stretchy - my fave! The quality so far has been good and the pants have good recovery, but the print is printed on a white fabric so I am a bit worried about how they will wear. They are fun though! As usual, I used my Mambo No. 5 pattern, which is a tried and tested amalgamation of all my favorite patterns. As usual, this round gave me some more ideas for alteration (I'm still working on some pesky knee wrinkles), but for the most part the fit is spot on! My secret is that the side seam allowance is a generous one inch, which allows me to baste the seam to test the fit with all sorts of different fabrics. In this case, I sewed the full one inch allowance at the hips but tapered to a 1/2" allowance in the legs to get the cigarette pants look I was going for. The other modification I made was to make these as pull-on pants. While I haven't had the best of luck with pull-on pants in the past, the fabric on these was stretchy enough to work perfectly. Previously I've had issues getting the waistband over my hips, so I really need a lot of stretch for pull-on pants to work with my proportions. 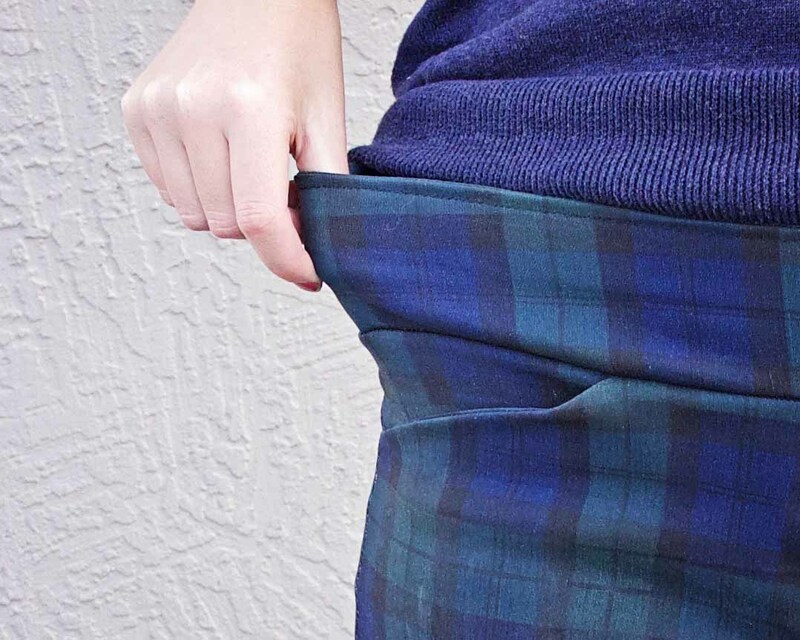 I also inserted elastic into the waistband, which helps keep everything snug. I also enjoy playing with the pockets on my pants. I've been looking for something a little less casual for front pockets, and tried these long horizontal slash pockets in the front. It's more work-appropriate without worrying that things will slip out. The pockets have a pocket stay, which keeps them in place when pulling them on. For the back pockets I experimented with a quicker way for doing the welts. I hate sewing welt pockets, but love that they provide a less-casual option. My results aren't perfect - I should have done a smaller opening so that the welt covers the whole pocket opening - but I'm excited to try these again. Hopefully, I can share more once I figure it out. I also tacked the bottom of the pocket to the pants so they stay in place. With the holidays approaching, I think these will be the perfect festive pants. I love a good plaid this time of year, and the stretch means that there will be plenty of room for eating. Happy American Thanksgiving to those who are celebrating! Love them! And your beatrice sweater :) The fit looks so good and a stretchy pair of pants that look work appropriate is just a godsend! wow that plaid matching is divine! super cute pants. These are so adorable! I'd love a pair! Totally fabulous! Almost makes me want to wear pants! !